Don\'t be shellfish... show this to others! The ultimate tool we have craved for ages is finally here: Facebook has enabled dynamic remarketing on its ad accounts so that users will be displayed the very goods they had viewed. Let’s explain what dynamic remarketing is in the first place. It is a way to show the ads based on the products the visitor had viewed but not bought, and remind the visitor to purchase the goods. Here, try to view the products on Pilulka.cz or add them to cart and check your Facebook account after a few minutes. 1) What do I need? I might have recommended the Business Manager as a neat tool to manage ad accounts in my last article (in Czech only – sorry, folks) but if you want to do dynamic remarketing, it is simply a must. No BM – no way. Oh, and just in case – don’t forget about the equation one advertiser = one BM account. 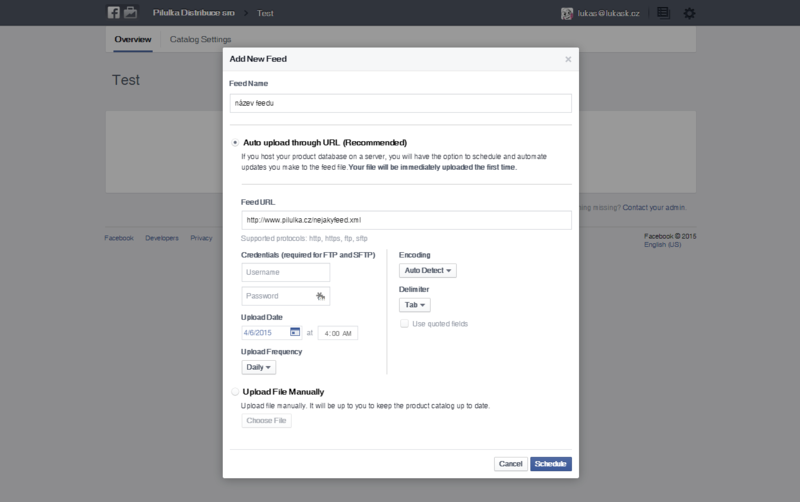 As usual, the Facebook dynamic remarketing is based on XML product feed. The setup is a piece of cake similar to that of Google Merchants feeds (what a truly unexpected and appreciated courtesy!). This means that you can use your old feed in many cases. If you come from a country that uses decimal coma ( , ) heads up – Facebook accepts the decimal full stop ( . ) only, so bear this in mind when filling in the price! If you do remarketing with Facebook, you already placed the code but now you need to add more information so that the system works properly. Facebook needs to know ID of the products the user clicked on or added to cart. For complete specification click here. It works quite the same as Google AdWords, though. Dynamic remarketing cannot be set up in Ads Manager so you have to use Power Editor but if you are used to working with PE, the setup is quite foolproof. The first step is to set up the product catalogue. Pairing with the XML feed and tracking pixel is an absolute necessity. The catalogue must be in the same BM as the advertiser account and the Facebook account on which you want to run the campaign. How to set up the catalogue? Select “Settings” and click on “product catalogue”. The setup is quite easy so there should be no major problems. Pair with the tracking pixel and the Product feed, and select automatic download. Immediately after saving the settings the feed loads for the first time and just after a couple of minutes the products are in the catalogue – no need for this several-days-approving-procedure of, for example, Google Merchants then. I always highly recommend to make a mind map of a campaign before setting it up. It is better to follow it right from the beginning than to make complicated changes retrospectively. Do I want to have the same text for each and every category? If not, you’ll have to create an independent ad set for every category. Do I want the same budget for each and every price level or CPC? If not, you’ll have to sort the ad sets by price. Do I want to distinguish between the customers that viewed the products and those that added it to cart? Do I want to distinguish between mobile phones and desktops? Do I want to distinguish news feed and the right-hand column on desktops? Do I want to distinguish gender? Open the Power Editor and select Ads -> create new. Add new campaign and set its objective to Product Catalogue Sales (if there is no such an option in your PE yet, you must be patient) and choose an appropriate catalogue from the BM catalogue menu. Name the ad or the ad sets and it’s setup time! Click on Ad Sets and set them up as you need. You can create a Product Set to use the ad set for chosen groups of products only (sort by category, price, brand etc. ); if you prefer to promote all the products, create and select Product Set All with no filter. First select the budget then select the targeting. You can target the customers that added a product to cart or viewed it or both groups. 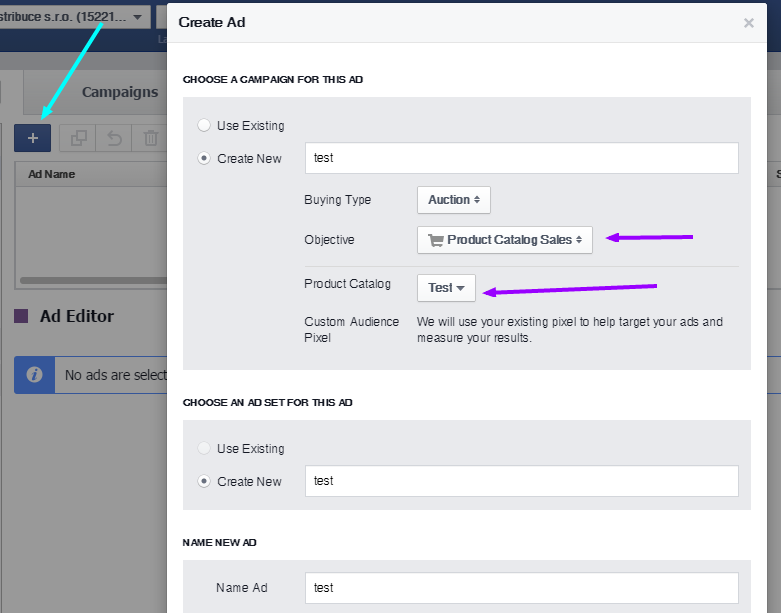 Decide for how long time the customers should be shown the ad, it is possible to combine this with other common Facebook targeting. However, it is often of not much practical use – unless you’d like to target different groups and bid on male or female users. Or if you, for legal or Facebook policy reasons, wanted to be sure that your ads are shown to adult users only. After selecting the Ad Set Placement (mobile – desktop, newsfeed – right-hand column) select CPC. In general and in the long run, Facebook’s automatic bidding is not the wisest choice and that is why you should choose the manual bids. I’d go for the higher shelf. After all, you are going to show very relevant ads to very relevant users. You cannot possibly wish for more. I have not yet found out if it is better to pay for a click or impressions but I think the situation may differ with individual projects. 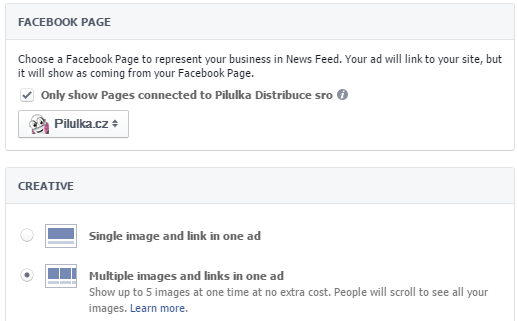 Now back to Ads where you select the Facebook page you intend to connect with the campaign, and the type of the campaign. Try what suits you better – if product ads (i.e. several little boxes in one) or traditional form of single post. They set up about the same. Insert the URL where the last link from the slider should redirect the customer and then insert the text that will be displayed above the product boxes. It is possible to add feed parameters using the + button but these are more efficient while having product boxes with the name of the product for the headline and with the price for the description. The parameters will apply for each product according to the XML feed. The following section is wholly arbitrary. However, if you advertise to make money and not just for the fun, you might want to analyze the efficiency. In the Tracking section insert UTM parameters and add the conversion pixel for further campaign analysis and optimisation. With a little good luck the campaign will start. With a little more luck the campaign will start making money right from the beginning. How do you like dynamic remarketing? Any questions or comments welcome!